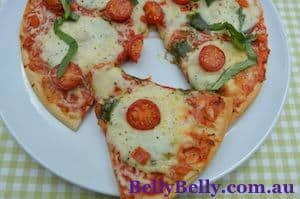 This pizza is very easy to make and does not need proofing time if you want to make it a thin crust. If you prove the dough, the pizza will be much thicker, but the dough does rise in the oven anyway when made as thin crust. Put the bread flour into a large bowl (you can also make the dough on your clean counter top if preferred), stir in the yeast and salt. Make a well in the mix and pour in the warm water and olive oil, pulling the mixture together with your hands or a wooden spoon, until you have a fairly wet but soft dough. If the dough is too wet, add a little more flour. Turn out on to a lightly floured surface and knead for 5-6 minutes until really smooth. Cover with a tea towel and leave to one side. If you want a more puffed up base, leave the dough to rise in the fridge, covered, for about 1 hour. Meanwhile, make your sauce by mixing together crushed garlic, passata and shredded basil. Season to taste and leave to one side. Split your dough into 2 balls and roll out to about 25cm/10inches in size in a circle shape and quite thinly unless you want the more 'doughy' pizza. Put each pizza on to a lightly floured baking tray, or if you have one, a pizza tray. Heat oven to 240 degrees C/475 degrees F/Gas mark 9. Top and bake with your choice of toppings for approx 8-10 minutes until crisp. Repeat the process with the second pizza so that it is ready to go in the oven as soon as the first one is finished. You can bake both at the same time, but the second one will need longer if on a lower shelf. Experiment with different toppings " tuna and sweetcorn with red onion, ham and pineapple, simple rocket and parmesan " really anything you want, but always remember the cheese on top!